Another soup recipe I hope you are excited. January seems to be a soupy month for my family. 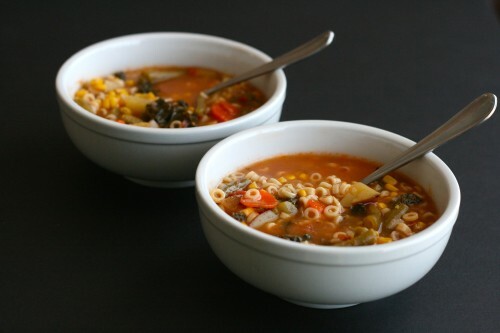 After the holidays I looking for quick, easy, and satisfying recipes and for me that is soup. Earlier I shared my version of Cream of Mushroom soup (it is gluten free, vegetarian, and low sodium). All-in-all WAAAAY better and better for you than the condensed canned version. After looking at my latest recipes in Diabetic Living Magazine my grandpa asked me how I come up with my recipe ideas. With freelance work I am given an assignment with specific parameters (office treats, slow cooker soups, diabetic friendly desserts, etc.) this makes developing the recipes easier knowing they need to fit into a specific box. It also complicates things because it can feel limiting trying to come up with something to fit into a very specific box. When I come up with ideas here I don’t really have any parameters which sounds freeing but it can be overwhelming too. I want to share family friendly recipes since we are a family of six and we need to eat. But I want the recipes to reheat well as leftovers just in case you aren’t cooking for a family. I want them to be relevant to the seasons or new twists on old favorites. Truthfully many recipes are inspired by what looks good in the stores or what I have in my fridge that needs to be used up. This soup came to me because I had carrots, celery, corn, and kale that all needed to be used in the next few days. A stomach bug has it our family and soup is so comforting when you are tired and not feeling well. 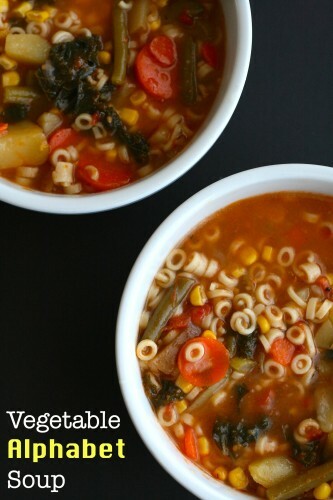 Do you remember eating vegetable alphabet soup when you were a child? This is another one of those soups I ate a lot of when I was in college. Hey canned soup is cheap for a poor college student! My pantry is usually stocked with pasta of all shapes. Unfortunately, I did not have any alphabet shaped pasta this time. I subbed in some ring shaped pasta instead. My joke is this is alphabet soup with only O’s. Felix was slow to like solid food but he could not get enough of this soup. He kept reaching for my bowl trying to grab handfuls for himself. Don’t worry my soup was lukewarm at best, I am a mom, I rarely eat a hot meal. Kale, corn, beans, carrots, celery, potato, garlic, and onions are the vegetables I had on hand. They worked well together. If I had peas on hand I would have used them in place of the beans. Don’t let my vegetables limit your soup, use your favorites! If you want to reheat this I recommend adding more stock to the soup at the time you reheat to “loosen” it up a bit. I do need to try more soups. The nights we go to the Y get hectic. This looks super tasty! 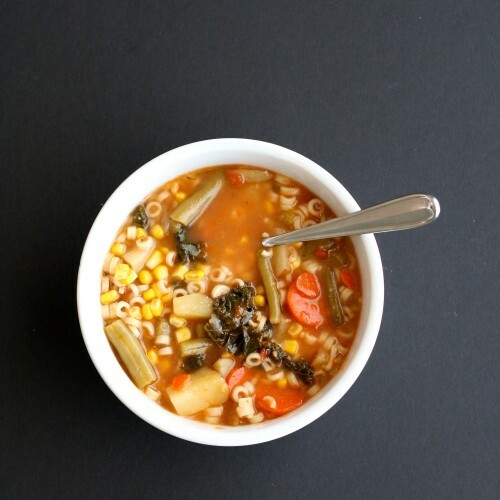 Soups are perfect for busy nights. We are soup finaticks! This looks delicious. Oh Mardra I hope you guys enjoy this one. 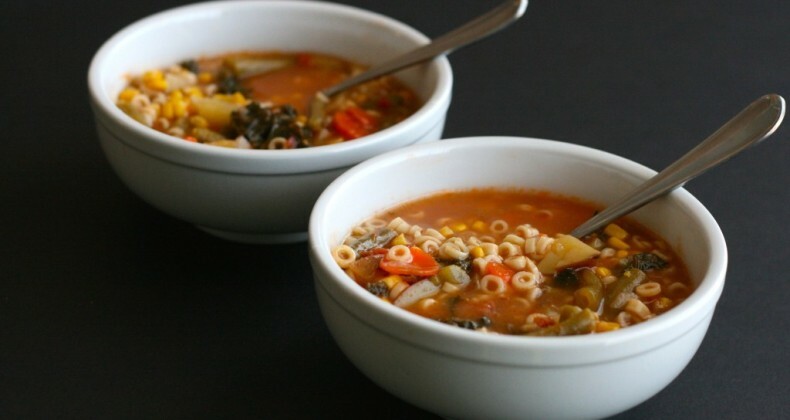 What a beautiful and hearty soup! I feel warm and full already just by looking at your photos of this recipe! Thanks Pamela, I am sure you could make a fabulous vegetable soup with all your garden bounty!